Living, to Joni Mitchell, is a contemplative expression of what she sees around her. A major force in the contemporary music world, her lyrics have become part of the social literature of our time. 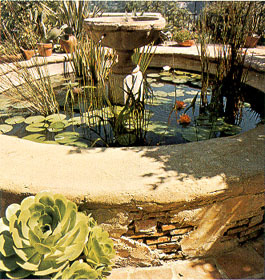 Her newly acquired house in Bel-Air, a secluded area of Los Angeles, needed to be her spirit defined in texture, color, line and shape. "I thought a decorator would come in with lots of ideas, and suppress what I like," Miss Mitchell says. 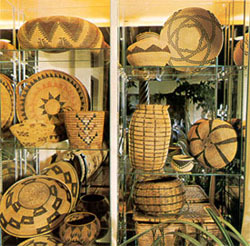 "My baskets and my Eskimo art, the way I like to live. 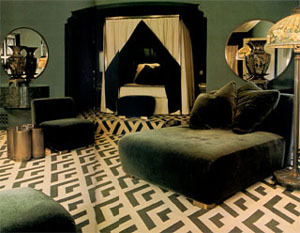 Decorated rooms sometimes sacrifice feelings and emotions for the sake of chic. The look is sometimes too polished. I couldn't live in a house like that. "A house is important to me. I have another place, in Canada, more like a cabin, really: one big room with a loft, and a cooking pot in the fireplace. There was no architect. I simply hired a stonemason, and we built it ourselves. The place itself is sheltered by trees that block out the view. Most city people would have cut them down and put in big glass windows. But if you want to see the view, you have to go outside. I like to go there three or four times a year and stay a couple of weeks-to feel renewed. I'm a nocturnal person, but I go to sleep there with the birds. I have good feelings in my house in California, too-the kind of feelings that go beyond the surface of things." Built in the 1920s, the house is in a luxuriant hilltop setting of flowers and shrubs; geraniums bloom in pots and Iceland poppies perch on stems that seem too fragile to hold their giant blossoms. 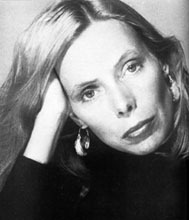 "When I bought the house it was run down," Joni Mitchell recalls. 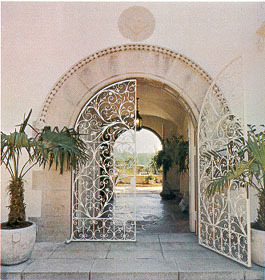 "There were inexpensive locks on the doors and lots of wire holding things together. There had been a lot of owners who didn't care; I had it repaired, then I began decorating it myself." When Miss Mitchell didn't know what to do next, she went to Sally Sirkin Lewis, designer and owner of the J. Robert Scott showroom, and asked her advice. "But first," she adds, "I decided most things myself-like painting the bedroom walls white, and the dining room royal blue. 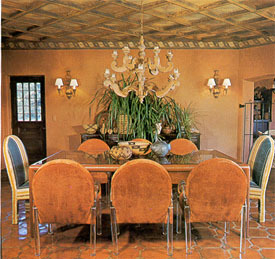 The former owners had painted the molding across the ceiling in orange, yellow and turquoise stripes. When my business manager saw it he said, 'I think you need help.' So I asked Sally if she would come in. Mrs. Lewis takes up the story. 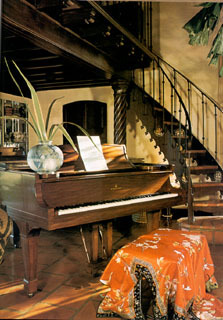 "After I saw the dining room, which was in the traditional colors of Italian donkey carts, I knew exactly the kind of house Joni wanted: colorful, charming, free. We started by sand-blasting the dining room ceiling and painting the walls. "Joni knew what she didn't want," says Mrs. Lewis, "which is more important than knowing what you do want. There are many approaches, many ways. She was open-minded and eager to consider new ideas. Her business manager was a little nervous at the beginning, but soon he told me to do anything I wanted. That was after the green wall incident." Mrs. Lewis smiles enigmatically. "When I first saw Joni's bedroom," she goes on, the walls were white, and the only furniture in it was her four-poster bed. The room looked like a bowling alley. I stared at it, and then suddenly I knew. 'Green,' I said, 'green walls.' 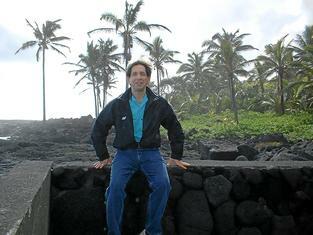 Her business manager said, 'I've gone along with you so far, but green walls I resist.' Joni said, 'I want things pure and simple.' And I said, 'Forget pure and simple. Green walls. You'll have to trust me. Today the bedroom is painted the color of a forest at dusk. Voluptuous ottomans, gently curved sofas and chairs-the same green as the walls-are grouped around the fireplace, and at hand are three guitars. It is one of Miss Mitchell's favorite areas of the house. Mrs. Lewis, too, dislikes the "decorated" look. "All those fashion tricks. A house isn't a series of tricks," she remarks, "it's a reflection of a person-the essence of the one who lives there. The designer is responsible for interpreting personality. I don't believe in creating monuments for myself or my ego. "Everything in design comes down to two people: the designer and the resident. That's all. It's so simple, and many designers complicate things with rules. You know, every lamp must be the same height, and every side table must be twenty-four inches high. Well, I say, Where is it written? Forget the games. Let's get down to basics and honesty. That's where design begins, and from there comes the sense of dramatic restraint, so important in every aspect of decorating." The house is free from contrivance. It is glamorous, but humor is there as well - the black-and-white powder room, with its mirrored table, and vanity stool skirted in black taffeta and buttoned with a rosette, is reminiscent of the opulent 1940s. On the walls are paintings by Miss Mitchell -the brooding words of her music swept into visual form on canvas. Fishtail palms, reaching nearly to the fourteen-foot ceiling, bend as if caught in the middle of a gale. "At first I didn't know about this room," she says. 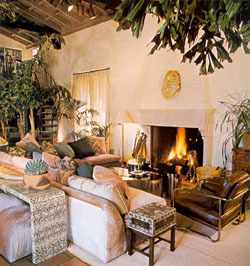 "Before Sally came in, all I had in the living room was a small sofa in front of the fireplace. I would put on a record, and the space was like a ballroom. At night I would sprint through from my bedroom to the kitchen to make a snack. But when the new sofa came in, I thought it was choking up the space. You see, I'd lost my sense of proportion, because I'd never lived in such big rooms before. Now I'm happy here. It's my home." This article has been viewed 31,843 times since being added on May 16, 2001.